Come Speed dating in Nottingham and you will get to "date" a number of people your age in a relaxed and safe environment. Most people who have tried it have been successful in getting a follow up date with someone they really want to see again,a nd sometimes they are quite literally spoilt for choice. You have so little to lose and so much to gain, so check availability at any of these future events that suits you best. If you are looking for an ultra stylish venue to chat, flirt and dance the night away, Nottingham’s Pitcher and Piano in the heart of the Lace Market ticks all of the boxes. A converted Grade II listed Church, this magnificent venue is incredibly popular when it comes to hosting our professionally hosted speed dating events and it’s clear to see why. With exclusive use of the upstairs bar overlooking the entire venue, the latest addition to the popular Marston’s bar chain is simply perfect for those looking to find love in city. Not only trendy in style with its mix of beautiful interiors but extremely comfortable, too this fantastic venue offers a range of delicious boutique drinks and speciality cocktails to make it a really chic nightspot to drink, chat and socialise with other likeminded singles from across the city. Plus, with an impressive central island bar, stained glass windows and high vaulted ceilings, this venue oozes class and sophistication. And when you are trying to get to know the speed daters all around you, we think this setting is ideal to put your mind at ease and let you enjoy the full-filled experience ahead of you. 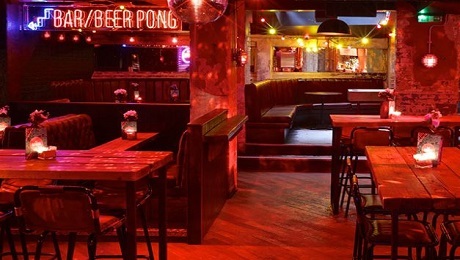 Hosting events at this uber trendy venue, Slow Dating are delighted to be working closely with the Pitcher and Piano in providing a chic, elegant and sophisticated venue to our wealth of keen Nottingham singletons all on the search for their perfect match. So, if you are looking for love, laughter and an fabulous fun filled evening out of the house, why not pop along to our range of upcoming Nottingham speed dating events and discover what Cupid has in store for you this year; we’ll guarantee you’ll have a great evening regardless of the outcome! There are a variety of reasons why people live in and around Nottingham. It is a great part of the world to live, yet often finding that right person can be quite difficult. Come Speed Dating in Nottingham and you will definitely improve your chances of meeting the right person. Nottingham speed dates are great fun - and with our cast iron speed dating guarantee, you simply can't lose. Checking availability is just a click away. If you travel around and find yourself in London during the week you may want to check out these London Speed Dating events.